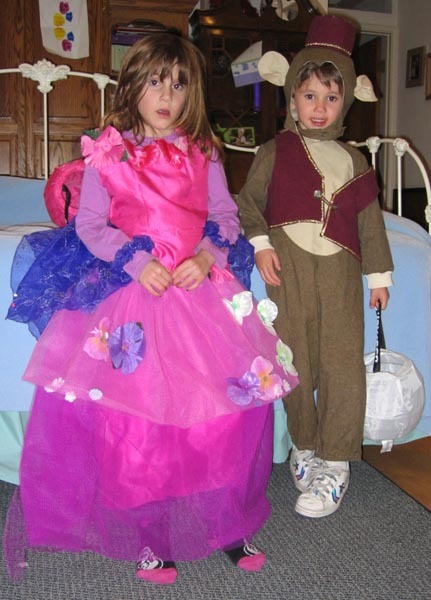 Pattern Description: Girl’s Fairy Costume consists of a sleeveless dress with a-line skirt, overskirt, and various embellishments. DD wanted the overskirt from view A (2-layer tulle skirt filled with flowers) and all the flower embellishments from all the views. I did not make any head ornaments or the wings. Based on her measurements, I made DD a size M(5/6) which I expected to be a little big. It was a little big. Yes, but the overskirt instructions were stupid. LIKE: It’s easy to sew. LIKE: The dress is nice. You could use it to make plain dresses for your girl. DISLIKE: The overskirt was a tie-on affair which I modified to an elastic waist. A polyester “dupioni” for the dress. Nylon netting for the overskirt. On the dress, I left off the facings. It’s a costume. I did a rolled hem on the neckline and armholes. I should have done that on the skirt, too. The pattern for the overskirt had you cut rectangles for the front and back (2) and sew them back together. I thought that was stupid, so I just cut the skirt to the right length and used the width of the netting (72 inches). Instead of ties on the skirt, I made a waistband out of the dress material and used elastic. I might sew the dress again as a general purpose dress for DD. However, I would not sew the overskirt again. DD didn’t like the overskirt. We’re going to sew the flowers to the dress. Plus, the nylon netting was not strong enough. It ripped the first time she wore it and was destroyed by the end of trick-or-treating. All she was doing was walking. The dress part of this pattern is really nice, but you really don’t need the pattern. 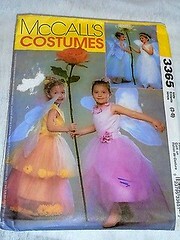 Just use the picture to create the embellishments with a dress pattern that you already have. The overskirt didn’t work for us, but I don’t know if it would have in a stronger netting or tulle.